Most Hebronites live outside the "arches," or old city. The new city is big but unattractive. Wedged into it from the north is Kiryat Arba, an Israeli settlement that is a thorn in the side of every peacemaker. The city's expansion has been going on for a century. The view here is at the end of the qussebah and looking at new streets beginning from this point, called Ein el Askar,, the policeman's spring. The triangular building used to be a hotel-, but when this picture was taken it was a shoe factory. Things were tense, because there were major Israeli construction projects nearby and the constant presence of Israeli security forces. Money was in short supply, but prices were high and families grew inexorably. 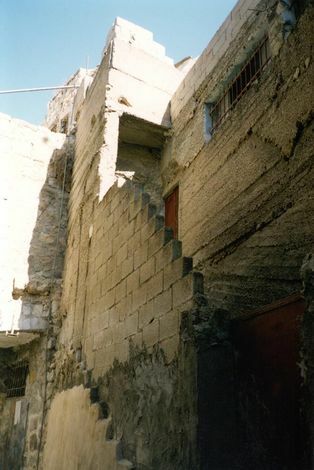 Additions were built without benefit of architect. 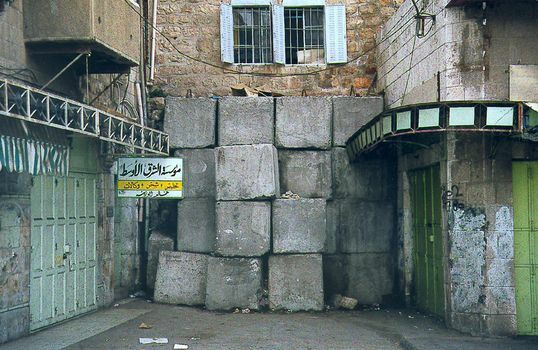 Concrete blocks like these were stacked up to separate Palestinian from Israeli areas. The Palestinians themselves didn't do their cities many favors, however. 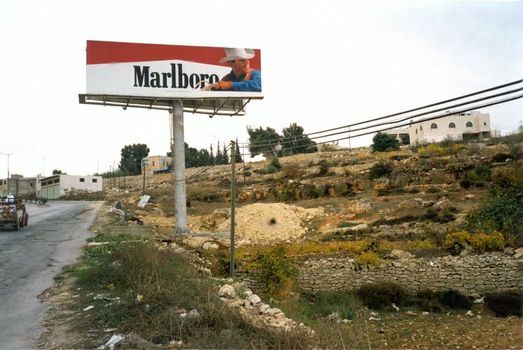 One company had the rights to erect pole signs at the entrances to all major West Bank cities. 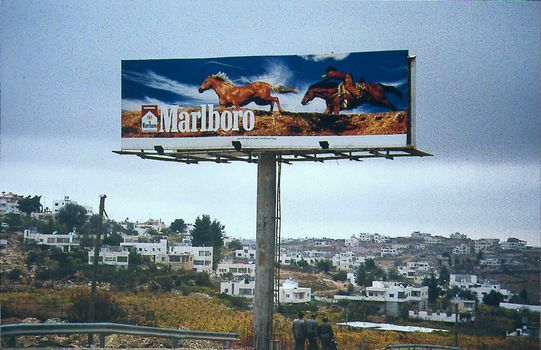 On the approach to Hebron, the Marlboro Man helps fight population growth in his own special way. The pole is a two-facer. 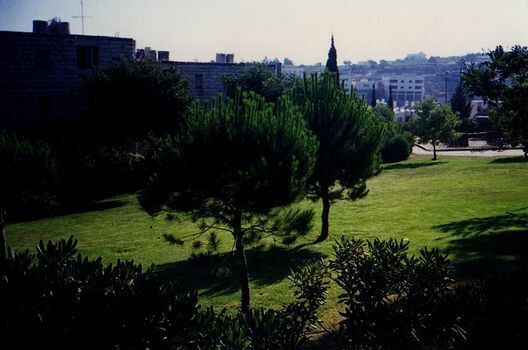 Here the view is north, towards Hebron's outskirts and the town of Halhul. Meanwhile there is Kiryat Arba. 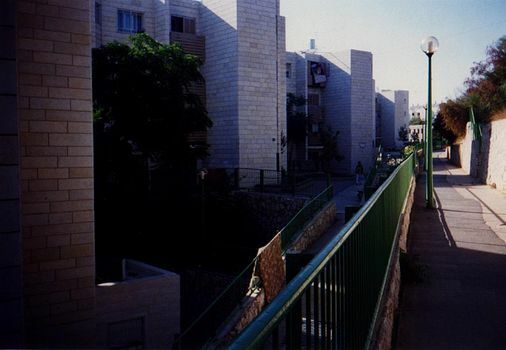 Shortly after the 1967 war, Israeli fundamentalists nudged and pushed the government of Israel into allowing them to establish this settlement, now a town of some 6,500 people. 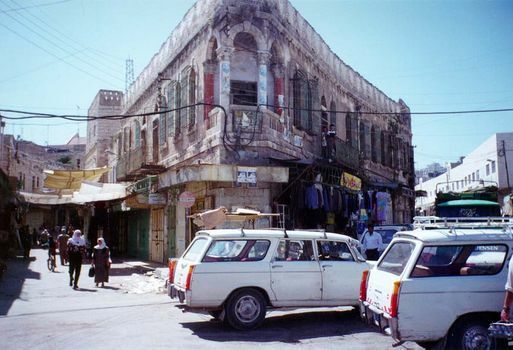 It was for these people, plus the couple of hundred settlers who lived in the Old City, that the Israelis refused to return control of the Old City to the Palestinian Authority. Few Hebronites enter Kiryat Arba, although some work in it. It's probably a good thing, for the sight of lawns like these would be almost an incitement in itself. Kiryat Arba, in short, has piped water, while the people in Hebron often do not.